BACKGROUND AND PURPOSE: Five to 60% of coiled brain aneurysms recanalize, generally because of coil compaction. In vitro exclusive use of complex-shaped coils allows better packing of the aneurysmal sac and the neck as compared with helical coils. We report a single-center, prospective study using complex coils. Safety, packing density, and recanalization rate were evaluated. MATERIALS AND METHODS: Seventy-seven aneurysms were embolized using complex coils alone. 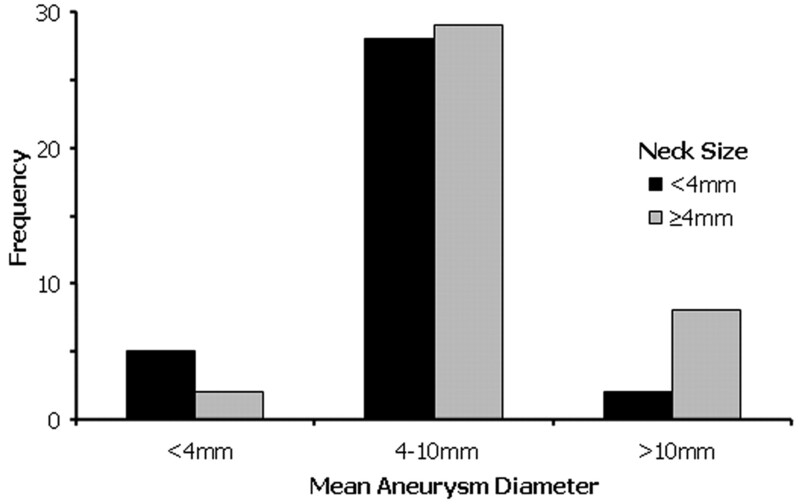 Aneurysms had a volume of 265 mm3 (diameter: 7.1 ± 3.3 mm) and a neck size of 4.1 ± 1.8 mm (range: 1.5–12 mm). Average follow-up available in 31 patients was 10.5 ± 7.6 months (range: 3–36 months). Primary angiographic endpoints included aneurysmal recanalization and (re)rupture. Primary adverse events included stroke or death. RESULTS: Complete or near-complete occlusion was achieved in all of the aneurysms but required balloon assistance in 24.6%. The packing density was computed as 37% ± 13%. No rerupture was observed during the follow-up interval. Recanalization was seen in 4 (12.9%) of 31. Two basilar tip aneurysms underwent a safe and complete recoiling. Periprocedural nondevice-related neurologic deficits were seen in 2 (2.9%) of 69 patients. CONCLUSIONS: The use of complex-shaped coils allows higher packing density, which may improve the recanalization rate. Basilar tip aneurysms remain a challenge. Embolization with detachable coils is a safe and effective treatment of brain aneurysms.1–3 The International Subarachnoid Aneurysm Trial (ISAT) recently provided level 1 evidence that the endovascular treatment of ruptured intracranial aneurysms results in better clinical outcomes compared with traditional surgery.4 The latest results from the International Study on Unruptured Intracranial Aneurysms (ISUIA) show that coiling is a valid alternative to surgery, especially in patients older than 50 years, patients with larger aneurysms (>10 mm), and aneurysms of the posterior circulation.5 The ISUIA, however, also revealed that, by using endovascular techniques and bare platinum coils, only 55% of aneurysms were obliterated completely, 24% were obliterated partially, and 18% could not be treated. Major shortcomings of bare platinum coils are compaction and aneurysmal recanalization, which may occur in up to 40% of cases, particularly in large aneurysms and aneurysms with wide necks.6–9 Recently, a new generation of bare platinum coils was introduced to the endovascular armament. The random 3D shape of the Trufill DCS/Orbit coils (Cordis Neurovascular, Miami Lakes, Fla) enables excellent conformability and permits a high and homogenous packing density.10–12 Clinical feasibility of aneurysm packing with complex coils alone has been demonstrated previously in a small patient series.13 Data from studies done on a silicone aneurysmal model showed that the exclusive use of complex-shaped platinum coils allowed a better filling of the aneurysm sac and the neck (range: 36%–38%; mean: 37%) compared with helical platinum coils (range: 32%–35%; mean: 34.5%) or a combination thereof (range: 31%–34%).11 A more homogenous aneurysmal filling was described with complex coils because of less compartmentalization as compared with helical coils. According to the hypothesis that a complete and long-lasting obliteration of the aneurysm is related to packing density, this new coil system may result in lower rates of recanalization. We report a single center, prospective safety study on the use of newer, complex-shaped, detachable coils for the treatment of ruptured and unruptured brain aneurysms. Our purpose was to evaluate the clinical performance of the Trufill DCS/Orbit coil system and to verify the in vitro findings in terms of packing density and durability of coiled aneurysms (efficacy). We also wanted to evaluate other aspects, such as safety, ease of use, and reliability of the mechanical detachment system. From May 2002 to May 2005, patients with brain aneurysms at our institution were randomly assigned to various treatment groups, including a group treated with different bare platinum coils, “bioactive” coils only, and a combination of bioactive and bare platinum coils. The data presented in this report are limited to 69 patients with 77 brain aneurysms, which were embolized using Trufill DCS/Orbit complex-shaped coils alone. Patient demographics are summarized in the table. Our institutional review board approved the study protocol. Informed consent was obtained from all of the patients or their designated health care proxy. Inclusion criteria for the study were patients with ruptured and/or unruptured aneurysms. The Trufill DCS system consists of a 0.012-inch bare platinum coil with a 0.018-inch detachment zone. The detachment zone is a polymer gripper, which is mounted to the coil delivery system.10, 11 The delivery system is a metallic hypotube with a hub at the proximal end. The hub is attached to a saline-filled syringe, and under hydraulic pressure the gripper releases the coil. The coils are placed through a 2.1F outer diameter (OD) microcatheter (Prowler Plus, Cordis Neurovascular). The Trufill DCS/Orbit represents the second generation of the Trufill DCS system. Although no changes to the coil were made, the profile of the detachment zone has been reduced to 0.014 inches, which allows coil placement through a smaller microcatheter (1.8F OD; Prowler 14, Cordis Neurovascular). The mean aneurysmal volume for aneurysms treated with Trufill DCS/Orbit alone was 265 mm3 with an SD of 500 mm3 (diameter: 7.1 ± 3.3 mm, mean ± SD) and a neck size of 4.1 ± 1.8 mm (mean ± SD; range: 1.5–12 mm). Details of aneurysm morphology are presented in Fig 1. The location of the aneurysms is summarized in the table. Similar to other studies,12 aneurysms were located at the basilar tip in 11.6% of our series. In 1 patient, the aneurysm was located on the pericallosal artery, which was the main feeding branch of an arteriovenous malformation located in the corpus callosum. We did not include mycotic or dissecting aneurysms in the present series. Patients underwent either general anesthesia or conscious sedation for the procedure. Access was obtained via the common femoral artery in all patients. Interventions were carried out on a biplane neuroangiography system with 3D capability (Artis; Siemens, Forchheim, Germany). In unruptured aneurysms, heparin was administered with an IV bolus (2000–7000 U) before the embolization procedure and monitored by serial activated clotting times (ACTs) with a target of >300 seconds. After 2003, all of our patients with unruptured aneurysms were pretreated with clopidogrel (Plavix) 75 mg PO and aspirin 325 mg PO starting 3 days before the procedure, because clot formation was observed at the coil-parent vessel interface in some of our coiled aneurysms. In ruptured aneurysms, the microcatheter was placed within the aneurysm before heparinization, which began after implanting the first coils. The ACT was maintained at approximately 200 seconds. Some of the patients received ketorolac tromethamine (Toradol) 30 mg IV as an aspirin substitute (15 mg in patients >65 years). Toradol inhibits synthesis of prostaglandins (nonsteroidal anti-inflammatory drugs) and inhibits platelet function. Patients available for follow-up angiography were studied at 3 months or at 6 months and at 1 year postembolization. In some patients, follow-up was available up to 36 months after treatment. The mean follow-up was calculated based on the longest follow-up period in each patient. Some of the patients were not available for follow-up because of regional mobility of the patient population, because they had expired from the sequelae of the primary subarachnoid hemorrhage (SAH), or for other medical conditions not related to the treated disease. Angiograms were obtained in several projections, including the working projection during coiling, which allowed the most appropriate delineation of the aneurysm neck. In nearly all of the aneurysms, a 3D angiography was available during coiling. A previously published grading scale of aneurysmal coil occlusion that is widely accepted by the neurointerventional community was used to characterize the angioanatomical results.16 Briefly, results were divided into 3 categories: 1) complete obliteration, with coils reaching the assumed boundaries of the parent vessel wall; 2) residual neck, defined as the persistence of any portion of the original neck, including the inflow and/or outflow zone; and 3) residual aneurysm, defined as any opacification of the aneurysm sac. At follow-up angiography, recurrence was defined as any increase in the size of the remnant or visualization of the neck resulting from coil compaction, a regrowth of the aneurysm, or filling of the aneurysmal sac. The recurrence was qualified as major if the residual angiographically visible size was amenable to retreatment with coils (>1.5 mm). Complete or near-complete occlusion was achieved in all 77 of the aneurysms. Because of neck size and configuration, 19 (24.6%) of 77 aneurysms required balloon assistance (Fig 2). Average coil packing density (volume filling) was 37% ± 13% (mean ± SD). Packing density was slightly higher for ruptured aneurysms (40–41% ± 10%, mean ± SD) compared with unruptured aneurysms (35% ± 14%, mean ± SD). The packing density for aneurysms coiled with the balloon-remodeling technique (36.7% ± 12%, mean ± SD) was the same as for aneurysms embolized without balloon assistance (37.0% ± 13.6%, mean ± SD). A, A 74-year-old woman with an asymptomatic wide-neck left middle cerebral artery aneurysm (size: 10 × 10 × 12 mm; neck: 7 mm). B, Balloon-assisted coiling (arrows) with tight filling of the aneurysm and preservation of adjacent displaced M2 branches. C, Postembolization angiogram shows complete occlusion of the aneurysm. D, A 22-month follow-up angiogram shows no aneurysmal recanalization or coil compaction. Follow-up angiograms were available for 31 (40%) of 77 aneurysms (Table). The mean follow-up time was 10.5 ± 7.6 months (mean ± SD; range: 3–36 months). Ten patients (32%) had a ruptured aneurysm, reflecting the initial ratio of symptomatic patients (37.7%). No rerupture was observed in the follow-up interval. Recanalization was seen in 4 (12.9%) of 31 aneurysms, including 2 wide-neck basilar tip aneurysms (neck sizes: 5.4 mm and 6 mm), 1 flow-related pericallosal artery aneurysm (neck size: 5 mm), and 1 large wide-necked supraclinoid aneurysm (neck size: 6 mm). 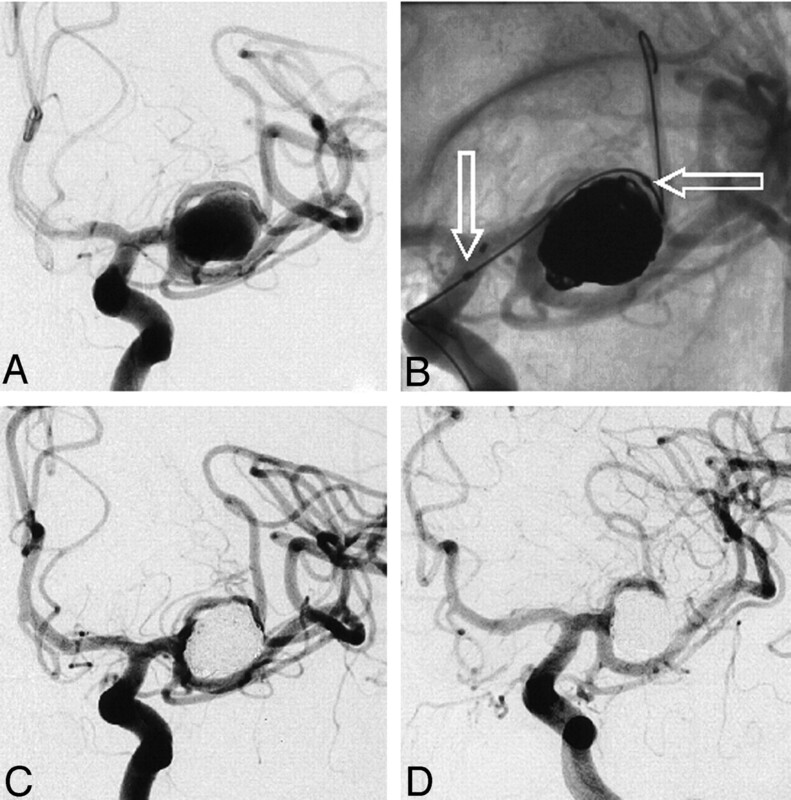 Nonsubtracted images of all 4 of the aneurysms showed a mild-to-moderate coil compaction and rearrangement of coil mass at the area of maximal flow impingement as determined by the orientation of the aneurysmal long axis relative to the axial direction of the parent vessel.17 All 4 of the aneurysms that recanalized had large necks (>4 mm). The packing density for these 4 aneurysms was calculated as 21%, 34% for the basilar tip aneurysms, 26% for the supraclinoid aneurysm, and 47% for the pericallosal artery aneurysm. Both basilar tip aneurysms, which showed recanalization, were recoiled (Fig 3); the supraclinoid aneurysm has remained stable over the past 36 months, without any further coil compaction at the neck. The patient with the pericallosal aneurysm refused retreatment. A 62-year-old man with a ruptured wide-neck basilar tip aneurysm (size: 10 × 9 × 8 mm; neck: 6 mm). A and B, Frontal and lateral views, respectively. 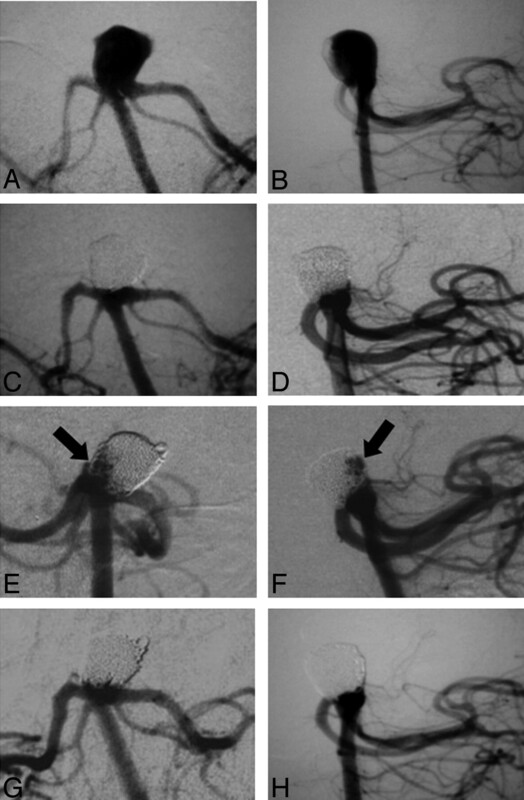 C and D, Control angiography after complete coiling (packing density: 34.4%). E (right oblique view) and F, 8-month follow-up angiography and recanalization of the posterior, right lateral aspect of the aneurysm corresponding with the maximum hydrodynamic impingement zone in the main axis of the basilar artery; a coil compaction is noted (arrows). G and H Control angiography after recoiling. With regard to periprocedural complications, in 1 patient we experienced coil stretching and dislocation, with subsequent retrieval. The patient did not suffer any damage to the arterial system and remained asymptomatic. In another patient, with a superior hypophyseal artery aneurysm, the 3-mm complex-fill coil was pushed out into the middle cerebral artery during placement of the second, 2-mm complex-fill coil. The coil was retrieved safely with a snare device, and the aneurysm was successfully obliterated. Periprocedural nondevice-related deficits were seen in 2 patients of the 69 treated patients (2.9%). First, during forced placement of the last complex coil, a fracture occurred and the coil had to be surgically removed. Second, a ruptured aneurysm reruptured during placement of the microcatheter. The patient with the fractured coil woke up from surgery with a progressively improving mild expressive aphasia. The patient with the reruptured aneurysm experienced delayed neurologic recovery. Nondevice-related death occurred in 3 patients (4.3%). A 45-year-old man with an end stage renal disease and ruptured aneurysms, presented as Hunt and Hess (HH) grade 3, died of a renal failure 2 days after the procedure. A 65-year-old woman with a ruptured basilar tip aneurysm and an 80-year-old woman with a posterior communicating artery aneurysm, both of whom presented as HH grade 3, died a few days after coiling from an extensive brain ischemia related to severe vasospasm. Our experience shows that there is an opportunity for further biomechanical improvement of the bare platinum coil. Complex-shaped platinum detachable coils appear to achieve a good safety profile comparable with other currently existing coil systems. In our series, we had nondevice-related periprocedural neurologic deficits in 2 (2.9%) of 69 patients; nondevice-related death occurred in 3 patients (4.3%). Device-related complications were not observed in any of the aneurysms treated (n = 77). This reflects an excellent safety profile of the presented coil system, one that compares favorably with previous studies. In a study of the HydroCoil, thromboembolic complications of 8.1% and intraprocedural perforation of 2.8% were reported.28 Murayama et al2 reported a total complication rate of 8.1%, with 2.4% thromboembolic events and a 2.3% rupture rate related to coiling. In a study with 1811 aneurysms treated, Henkes et al29 experienced a total of 17.4% periprocedural complications, including 6.0% of thromboembolic events and 3.1% of aneurysm rupture during coiling. Recently, studies done on a silicone aneurysmal model showed that complex-shaped platinum detachable coils allowed a better and more stable filling of the aneurysmal sac compared with helical platinum coils, achieving a packing density higher than 30%.11 It has been further shown in clinical series that a statistically significant increase in packing density is achieved in aneurysms predominantly packed with the larger diameter Orbit complex coils versus those predominantly embolized with the Guglielmi detachable coil (GDC) 10 system.12, 30 The relation between packing density and compaction in brain aneurysms that were treated with coils has been studied previously. Although the data originated from small, single-center case series, they showed that packing of more than 20%–25% resulted in lower rates of coil compaction.27, 31–34 In a larger study, Sluzewski et al8 retrospectively reviewed 160 patients with aneurysmal SAH and followed patients up to 6 and 18 months after coil placement. The authors reported that the relative risk factors for aneurysmal recanalization at 6 months were the age of the patient, aneurysm size ≥15 mm, and aneurysm location in the posterior circulation. In another study, the same group reported that high packing density (≥24%) protected against recanalization in aneurysms with volumes smaller than 600 mm3.32 In particular, in aneurysms packed more than 20%, compaction did not occur if the aneurysm volume was less than 200 mm3. In their study, 75 (53%) of 145 aneurysms were packed accordingly.32 In another study by Slob et al,30 194 aneurysms were followed angiographically to compare recanalization and retreatment rates for aneurysms embolized predominantly with the complex Orbit system versus the GDC 10 system. Approximately 16% of the aneurysms in the Orbit cohort were not completely occluded after 6 months compared with 22% in the GDC cohort. Retreatment rates were also lower in the Orbit group, at 7.8% compared with 13.3%. Although both recanalization and retreatment rates were lower for Orbit, statistically significant results were not obtained. Overall, our data seem to confirm such findings in patients with ruptured and/or unruptured brain aneurysms. We were able to achieve packing densities >35% despite the inclusion of several large-volume aneurysms in our cohort. Perhaps concentric filling with the use of complex-shaped coils in conjunction with the softness of the design enables a safe, dense, and homogenous packing even in ruptured aneurysm without loss of shape retention. Four (12.9%) of 31 aneurysms treated with complex coils alone that were evaluated angiographically had an area of recanalization. In 2 cases recanalization occurred at the base, resulting from coil compaction. If aneurysms were located at the basilar tip (n = 2), a filling of the aneurysmal dome was observed related to coil rearrangement. Packing density was slightly higher for ruptured aneurysms (41% ± 10%, mean ± SD) compared with unruptured aneurysms (35% ± 14%, mean ± SD). This may be related to the fact that ruptured aneurysms have a higher clot burden, and incomplete filling on angiograms may mask the true size.35 Thus, a larger amount of coil may be placed either within the clot or partly through the rupture site into the CSF space, rendering an artificially higher coil metal-to-aneurysm volume ratio. The study is limited by the fact that a follow-up angiography was available in only 40% of aneurysms. Patients were lost because of death related to comorbidity, vasospasm, or the dynamics of the community and limited patient compliance. We used the definition of aneurysmal recanalization as suggested by Raymond et al,16 which, though widely accepted, is definitely arguable. Another major limitation is that the study summarizes data from a single center with a small number of patients treated. Currently, a multicenter prospective study is being conducted on a larger cohort of patients treated with complex-shaped detachable coils alone and/or in combination with other types of coils. However, because most of the aneurysm recanalization occurs within the first 12 months (>70%) after coiling,16 our data are suggestive that improvement of bare platinum coil design may reduce coil compaction. In addition, aneurysmal volume calculations and packing density based on angiography are limited by arterial pulsation, expansion of aneurysmal size during diastole and systole, intra-aneurysmal clot burden, and intrinsic limitations of the imaging system. Calculation of the volume of the aneurysm under the assumption that the aneurysms are approximately ellipsoidal has limitations in accuracy.36 However, determination of aneurysmal volume remains an important area of research,37 with no particular method having an established improvement in accuracy. Although 3D reconstructed angiography may more accurately determine the aneurysm volume, the subjectively defined gray-scale thresholding can produce large variations in the partial volume calculation. Other intrinsic factors, including micromotions of the patient's head due to breathing, axial and radial motion of the vascular structure, flow irregularities at the boundary, motion of the C-arm during rotational angiography required for the 3D image reconstruction, voxel volume averaging, edge unsharpness, differences in magnification during the rotational acquisition because of aneurysm/flat panel detector or image intensifier, and anode distance, add to misregistration. Although suggested by some investigators, so far no studies have validated the accuracy of 3D angiography in clinical practice.36 Thus, aneurysm volume calculations based on 3D-rotational angiography remain of an investigational nature. On the other hand, the method used to calculate the aneurysm volume in this study has been applied in numerous series,15, 17, 25, 27, 31, 38, 39 thus allowing comparisons to be made because common methods were used. In our small series of patients treated for ruptured or unruptured cerebral aneurysms with limited follow-up angiography, a reduced incidence of recanalization was observed after endovascular embolization with complex-shaped bare platinum coils. Basilar tip aneurysms remain a challenge. The combination of a biomechanical mature system as a platform with a bioactive material that promotes healing and scarring/neointimal formation at the aneurysm neck is compelling. Accepted after revision December 12, 2006.